Thoughts on the running backs, Bobby Wagner's leadership, the offensive line and more. 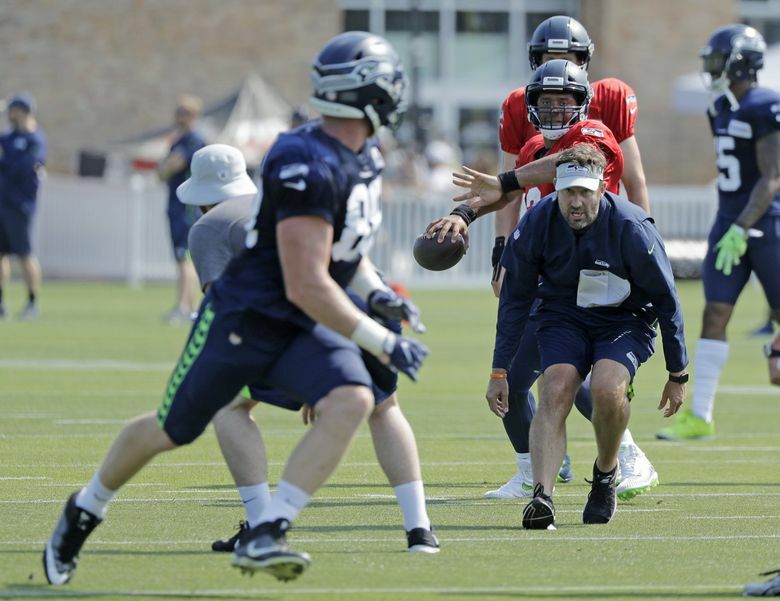 It was another hot day at Seahawks’ training camp Monday, and another day with no shortage of interesting developments. Here are some notes and impressions from practice from beat writers Bob Condotta and Mike Vorel. — The Seahawks signed free safety Lorenzo Jerome Monday replacing the roster spot that opened up when linebacker Joshua Perry announced his retirement, citing concerns over concussions — Perry left the field late in Friday’s practice. Perry was in his third year out of Ohio State and played previously with the Chargers. Jerome played four games last year with the 49ers before being waived and is adding depth at a safety spot in need of it with Earl Thomas remaining a hold out. — Doug Baldwin again sat out with a compression wrap on his left leg. There was no official word on his injury as Pete Carroll did not speak to the media Monday. It was the second straight day Baldwin sat out. David Moore also sat out with an undisclosed injury. That had Tyler Lockett, Jaron Brown and Marcus Johnson working with the starting unit at receiver in three-receiver sets. The second receiver grouping was typically Amara Darboh, Keenan Reynolds and Damore’ea Stringfellow. Brandon Marshall remains limited to only individual drills. Once he is cleared for 11-on-11 drills that will obviously change the equation some. — Fullback Khalid Hill took off his pads and spent the last part of practice on sidelines with a wrap on his shoulder after being injured. Again, it was unclear the specifics of the injury with Carroll not talking on Monday. Hill’s injury left the Seahawks with just one healthy fullback — Tre Madden — as Jalston Fowler also sat out on Monday with an undisclosed injury. — Shaquem Griffin had an interception of Wilson during a redzone drill, stepping in front of a pass intended for Nick Vannett. The pick came during a seven-on-seven drills, or meaning there were no linemen (here’s video from the Seahawks). — And in your daily kicking update, Jason Myers handled all of the PATs and field goals with the team giving Sebastian Janikowski the day off (special teams coach Brian Schneider said kickers and punters will be given regular days off to keep their legs fresh). Myers was 4-5, hitting from 33, 48, 40 as well as a PAT, but missing from 48. Jon Ryan held for all five kicks. — The players who have been on PUP/NFI (Dion Jordan, Ed Dickson, Dontae Johnson) remain out. Much has been made of who will assume more of the leadership on defense with the loss of so many of the team’s strong voices of the past few years. Middle linebacker Bobby Wagner — who it may be easy to forget has been voted a defensive captain two of the last three years by teammates — said emphatically last week that he will provide all the leadership the team needs. Maybe it’s because we’re looking more for it with guys like Richard Sherman and Michael Bennett now elsewhere, but Wagner appears more vocal than ever this camp. Monday, Marcus Smith jumped offsides at one point with Wagner then giving him a strong tongue lashing, a punishment that only increased when Smith then had to run a lap, the standard punishment for such a discretion. Until Monday, Germain Ifedi had been used only at right tackle with the Seahawks keeping their number one offensive line intact other than right guard D.J. Fluker being rested at times (with Willie Beavers generally stepping in for Fluker). But Monday, Ifedi got a handful of snaps at right guard in place of Fluker in an alignment that had Isaiah Battle at right tackle along with the other three starters who at this point appear set in stone — center Justin Britt, left guard Ethan Pocic and left tackle Duane Brown. Offensive line coach Mike Solari said after practice the team is going to work with some different combinations as camp progresses, with the Seahawks needing to assure they have enough players who can play multiple spots if needed, but also to make sure they have the best five on the field. While there is a lot of focus on Ifedi after his penalty struggles of a year ago, the move might also speak to what the team sees in Battle, a player the Seahawks acquired in a trade with Kansas City last year and was on the roster for the first seven games of last season before ending the year on the practice squad. And maybe it speaks to also wanting to see how things look at guard with Ifedi. Solari said not to read too much into some of the rotations that will be seen over the next few weeks saying it’s all a part of what happens in training camp. Monday also marked the first time that George Fant and Rees Odhiambo – each coming back from season-ending injuries a year ago — took part in 11-on-11 drills. Fant worked at left tackle and Odhiambo at left guard and Solari said that for now that’s where each will stay. There has been talk of using Fant at right tackle, and Carroll said in the spring that could be considered. But for now, as Fant gets back into playing shape after roughly 11 months away, the team wants to leave him where he is most comfortable. As for Battle, he had some nice moments in the pass rush drills Monday and his size, well, stands out — at 6-7, he is the tallest of Seattle’s offensive lineman. During one drill Battle proved a too-imposing object for a blitzing Shaquem Griffin to get around, with Battle easily standing his ground and giving hand gesture appearing to let Griffin know about it afterward. And for what it’s worth, we’ve gone two days of pass rush drills without a fight though there was at least something of a love tap handed out by Pocic to Nazir Jones, Pocic giving a quick push to Jones following one of their battles. As noted, Baldwin missed his second consecutive practice on Monday, watching the roughly two-hour session at the VMAC in a jersey and a baseball cap. Keenan Reynolds gave him a lot to see. Most notably, Reynolds — a 5-foot-10, 191-pound receiver, who would normally operate as Baldwin’s backup in the slot — beat cornerback Neiko Thorpe off the line in a team drill, turned his head and secured a diving catch over his shoulder from Russell Wilson, providing arguably the play of the day with a 30-yard score. The former prolific Navy quarterback, who was drafted by the Baltimore Ravens in the sixth round of the 2016 draft and has also spent time with the Washington Redskins, has piled up consecutive impressive practices in Baldwin’s absence. First-year Seahawk Jaron Brown made the other notable touchdown snag during Monday’s steamy morning practice, beating free safety Tedric Thompson deep and hauling in another accurate Wilson delivery. Brandon Marshall, perhaps the most intriguing wide receiver in training camp, continued to sit out team drills as he slowly returns from ankle and toe injuries. He did run routes with his fellow receivers early in practice, though. Seattle continues to experiment with different starting tandems at the safety position. The constant throughout the first four practices of training camp has been sixth-year pro Bradley McDougald, though he has alternated between free or strong safety to accommodate either free safety Tedric Thompson or strong safety Delano Hill. A new contender finally emerged on Monday, however. Former Los Angeles Ram Maurice Alexander — who has been limited to this point as he continues to recover from a shoulder injury — participated for the first time in team drills on Monday, lining up as the starting strong safety opposite McDougald. In four seasons with the Rams, Alexander started 23 games and produced 82 tackles, three sacks and two interceptions. If standout free safety Earl Thomas eventually ends his holdout, he and McDougald will undoubtedly claim starting roles at the back end of the Seahawk secondary. If not, Alexander, Thompson and Hill will continue to vie for a starring role. By now, you’ve probably heard a familiar refrain regarding the Seahawks’ stock of running backs. But, maybe most importantly, they’re healthy. Specifically, third-year running back C.J. Prosise is healthy, something that has been far from a given since he was drafted in the third round of the 2016 NFL Draft. Prosise certainly looked the part on Monday, at one point snagging a catch on a shallow cross from Austin Davis, using a burst to get the corner and cruising 20 more yards into the end zone. And, speaking of versatility, rookie running back Rashaad Penny has shown plenty of that to special teams coach Brian Schneider this offseason. Penny returned seven kicks and one point for scores in four seasons at San Diego State, twice being named Mountain West Special Teams Player of the Year.